Most of the charm squares (from the pack I told you about last week) are very similar prints: bright, sparkly and vivid. There are a handful, however, which are less so. 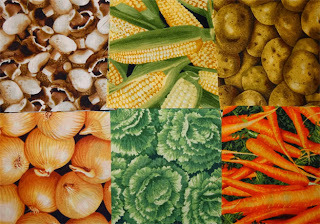 Such as the "potatoes" squares, "mushrooms" and the "cabbage" squares. They're OK, but they don't blend well with the others, so I've pulled them out and have decided to make placemats with them. 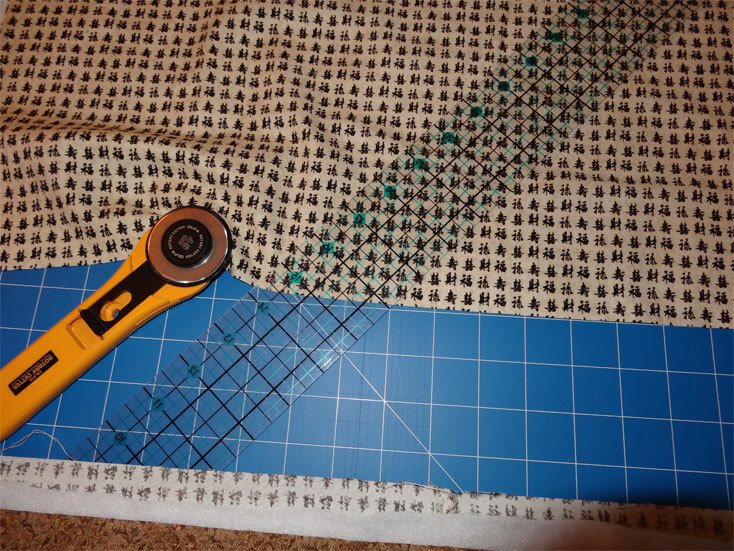 Like Quilt 13 (the table runner with Japanese prints), I expect they'll work up pretty fast. 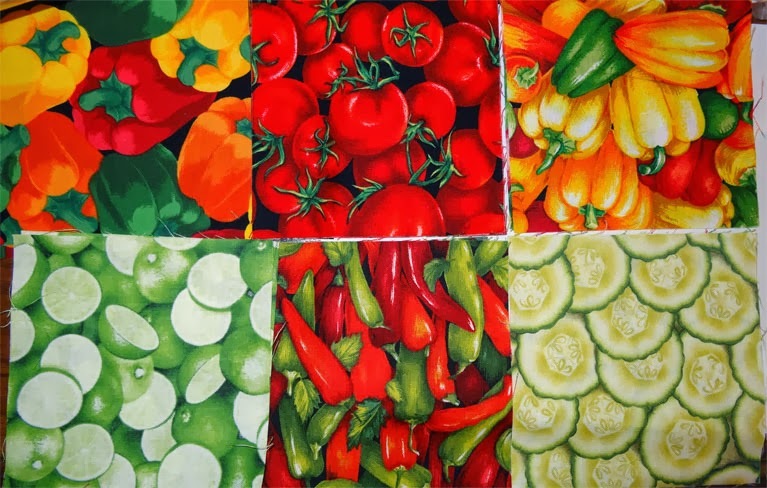 And as I'm not really in LOVE with the prints, if beef juice or red wine (or, more likely, curry sauce) gets spilled on them, well, so what?!?! 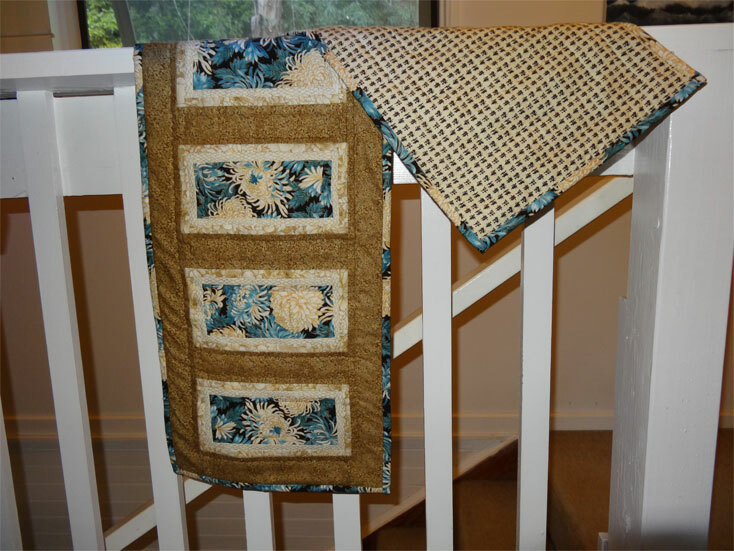 Six charm squares make up almost a placemat-sized rectangle. I'll edge these with plain solid black calico. Who would pair asparagus with peaches in a dish? Well, not me. It doesn't make sense from a culinary point of view, but at least the colours don't scream "WRONG!!".... at least not to me. The carrots kind-of "pop out". I tried swapping the corn and carrots, but ended up thinking this arrangement is probably best. Well, sports fans, there's gonna be plates, cutlery and table napkins sitting on top. 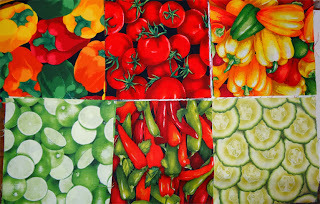 Finally: bell peppers/tomatoes/bell peppers and limes/chilis/cucumbers. Yeah... a bit much. I know. Again, I tried different arrangements, but this one is the most harmonious (keeping in mind the fabric in real life looks just a smidge different than it does in photographs). This one is garish, but might be nice for the picnic table...? So there you are. 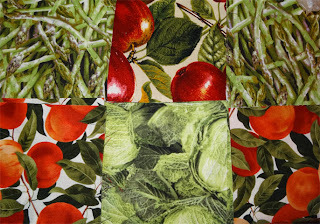 There are enough of these prints to do 2 of each of the above 3 combinations, 6 placemats in all. I've stitched the charm squares together, but haven't added the edging yet. I'm holding off on that. 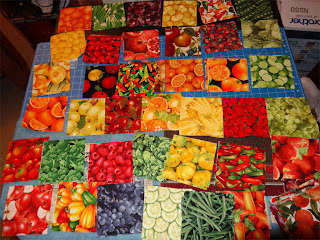 I've got the black calico but have decided to go with a "throw" size quilt and a table runner, and am thinking I should get those measured and thought out before I cut into the calico for these placemats. These will make nice little "portable" projects, too. Something I can easily tote with me when I visit my friend and quilt guru Pauline (and I'm hoping to see more of her in future... ...I'm even working on her to let me photograph some of her divine pieces so I can share them with you here... ... Keep your fingers crossed, because she could say "no"...). 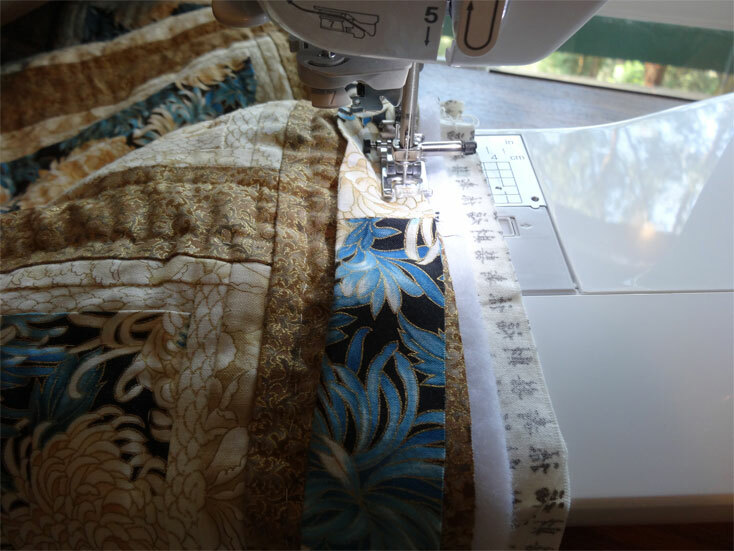 On my last visit to Florida (late May of this year) I headed to Cousin Toni's favorite quilt shop and did some "indulging". One of the things I brought back was a couple packets of "charm squares" cut using veggie/fruit prints. I'd picked up a yard or so of a "tomatoes" print back in 2011 (in Ohio) but hadn't done anything with it (no really good ideas yet). But here were 2 packages of 36 5x5 squares - 18 different prints. Well, you just KNOW I couldn't pass them up. Almost makes you drool, doesn't it? But wait. Notice some of the prints have definite black backgrounds. Some are just solid fruits (in whatever colours). And notice the cucumber bit right there in the center bottom. Very light - and a shade of green that doesn't seem to quite match/mate with anything in the entier pack. Now, some of these are bright, vibrant colours. Others? Hm... the potato print? Cutsy, but not exactly splashy. And mushrooms? Also brown. Quilt 13: Japanese Table Runner - DONE! 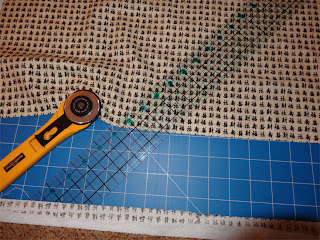 I've never done a table runner before. It was an immensely satisfying project from the standpoint of creativity, speed and results. Hm... I'll have to do more of these. I've got some Christmas prints stashed away, and maybe those would do well as table runners...? 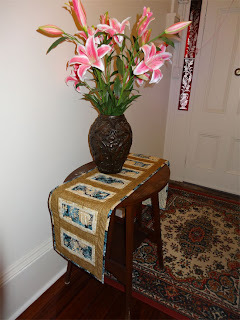 It's been two years since I told you about my plans for a table-runner quilt, made from Japanese prints. I had the fabric, came up with a design, all ready to go, but somehow... ..well... it just never happened. It only took me 2 years to get around to this... and the quilting and finishing on this project will go very fast. 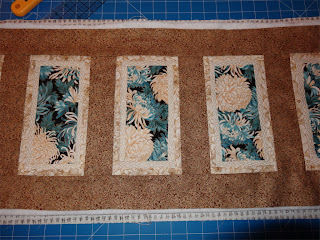 I'm going to stitch inside the flower blocks and then around the edges, but not much more than that. I'm using a cream thread, which shows up nicely, gives just the effect I'm wanting for this project.